Come for the Feast (and exchange your lead bullets) on Hunter’s Mountain in the Unama’ki Highlands on Thursday, October 8, 2015. We would like to invite you to our annual Feast in the Highlands to celebrate work on developing a management plan for moose in Unama’ki as we dedicate the Feast to our friend Blair J. Bernard Sr.
Clifford Paul, UINR Moose Management Coordinator was a great friend of Blairs. 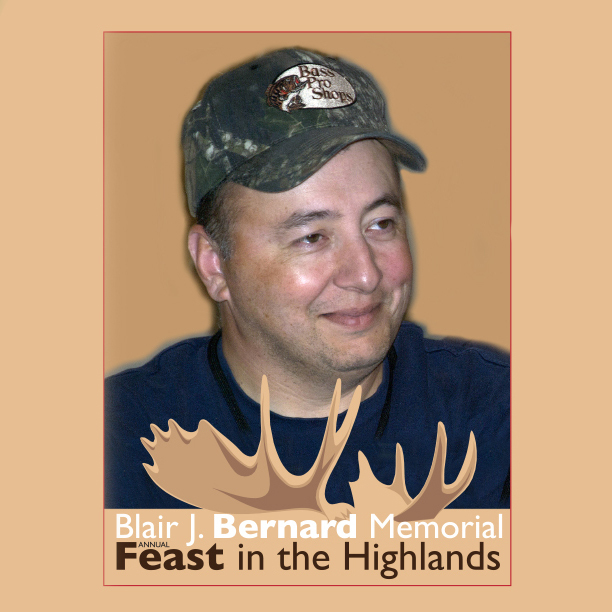 “For the past ten years the Moose Working Group and UINR hosted the Feast in the Highlands and this year we are changing its name to the Blair J. Bernard Memorial Feast in the Highlands. Blair was a long-time employee at UINR and a friend to everyone who knew him. What started ten years ago as an opportunity for people involved in moose management to get together to celebrate their progress, has grown to include both Mi’kmaq and non-native moose harvesters, Elders, youth, conservation officers, and interested people from the community. Feast in the Highlands is scheduled for Thursday October 8 at 12:30 at the paved airstrip 13 km from the Hunter’s Mountain entrance. Clifford Paul has been involved since the beginning. “For the second time, this year UINR, in partnership with the Nova Scotia Federation of Anglers and Hunters, we will be conducting an ammunition exchange to promote non-lead hunting alternatives. Harvesters can bring in boxes of lead bullets and receive copper bullets in return. The feast is very important–especially from a management perspective. That we have both Mi’kmaq and non-Mi’kmaq harvesters gathered, in the peak of the season, sends a strong message of stewardship and cooperation for moose and moose habitat.